It just keep getting better. Last year I made my own bacon (cured and smoked pork belly) and fabulous homemade pastrami (a corned beef brisket coated in spices and smoked). 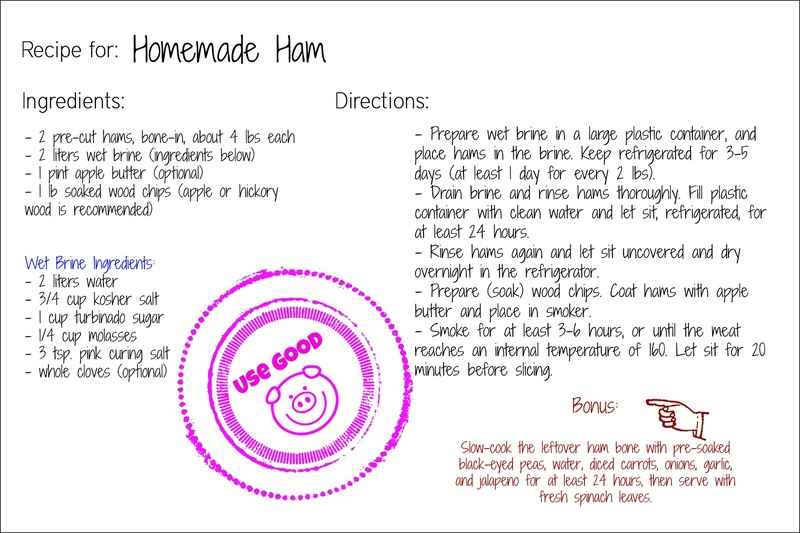 Most recently, and using similar process, I made ham as well. It’s pretty easy to locate an uncured ham bone in most grocery stores, or your butcher should be able to hook you up with one. A pork shoulder cut would also work. The idea is that you let the bone-in pork leg cure in a wet brine for about a day for every two pounds, then you let it sit uncovered in your fridge for another day or so, and then you smoke it until it’s reached 160 internal temperature. There was some disagreement in the various recipes I read about the part in between the wet brining and the uncovered setting; some recipes said to let the hams soak overnight in water to get out the excess salt, and others said just to give it a good rinse. Since I had two hams, I did both. The ham that soaked overnight in water was obviously less salty, so I coated it in apple butter halfway through the smoking process. In the end, I had a sweeter ham and a saltier ham, but both of them were very tasty and made a few excellent meals. 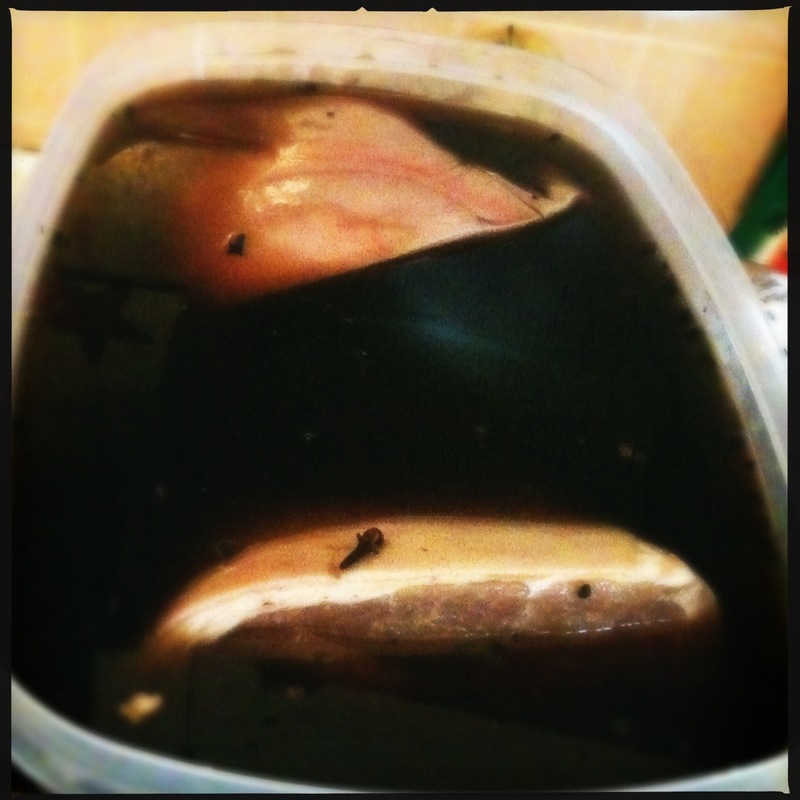 Measure how much liquid brine you will need by first placing the hams in your plastic container to judge the volume. I had to double the recipe, but I used two small hams (about 4 lbs. each). 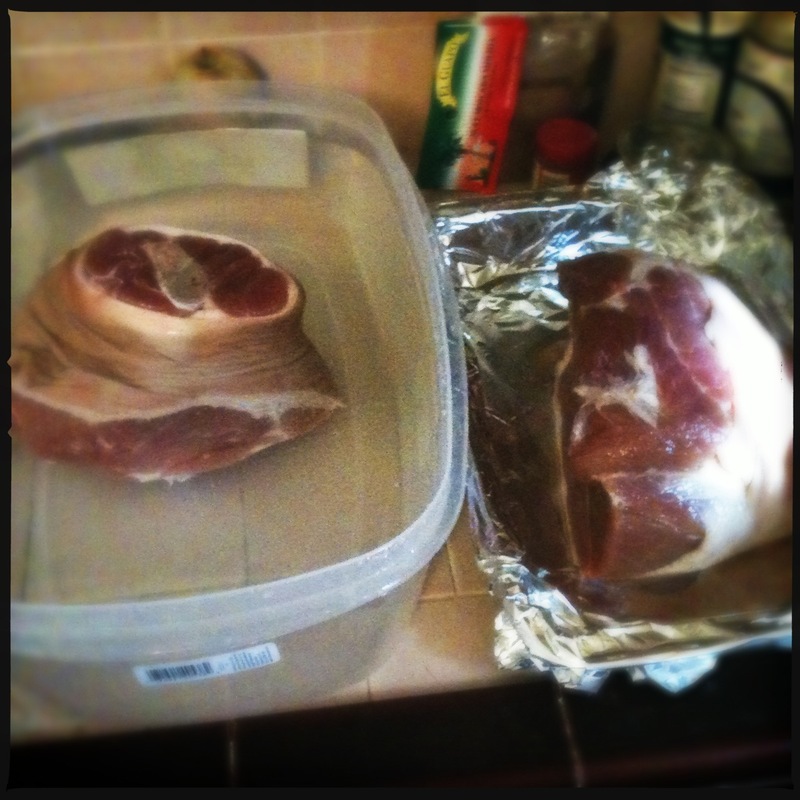 As you can see, I also needed a pretty big plastic container to hold both hams. Make sure you get one with a lid and make sure it can fit in your fridge (I had to measure the interior of my refrigerator just to make sure). The ham(s) sit in the brine (covered) for about a day for every two pounds of meat. 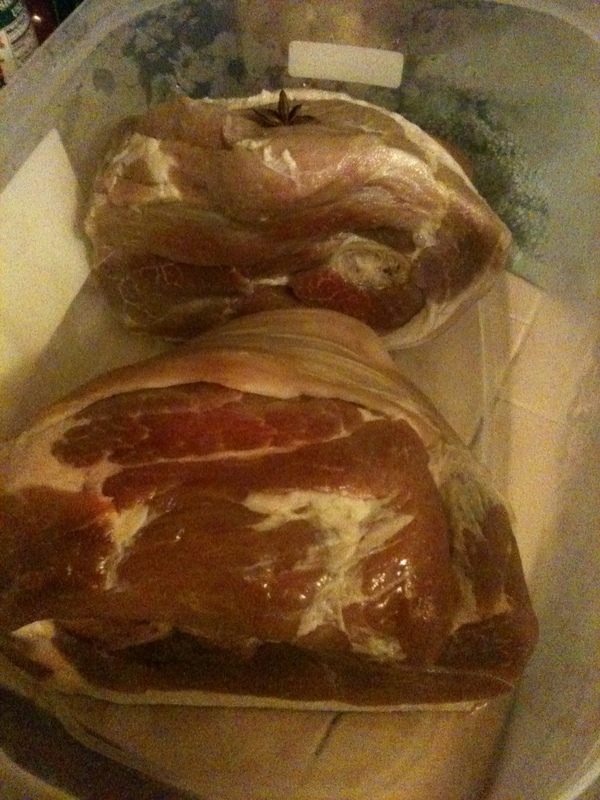 Then I let one ham soak in water, and then both of them sat uncovered for a day. This lets a pellicle form over the meat, which is an invisible, sticky film that seems to act as a glue for the tasty smoke. 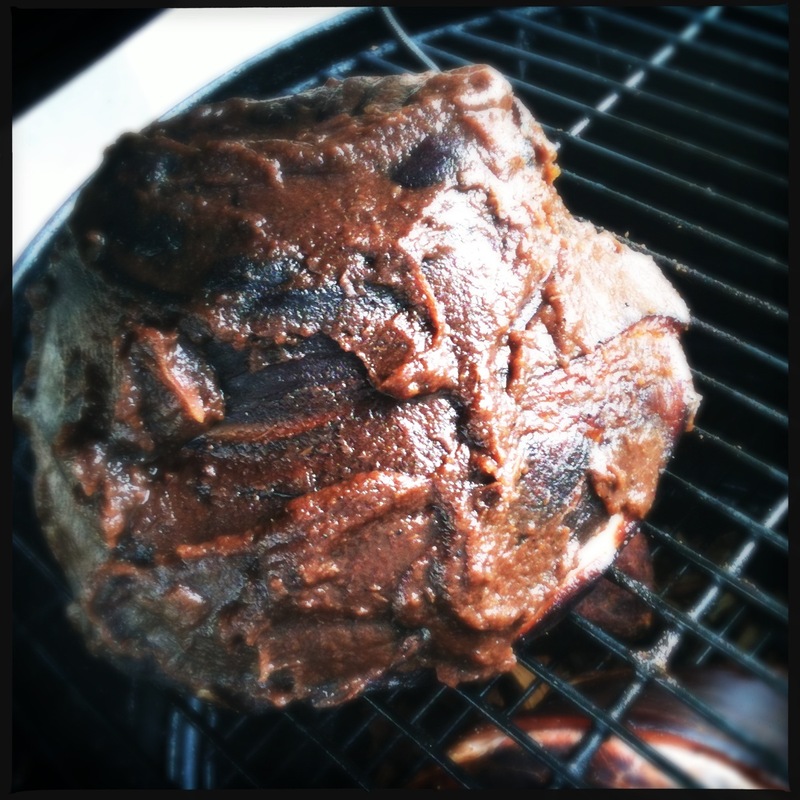 I used hickory and applewood chips, and changed the positions of the hams halfway through the smoking. 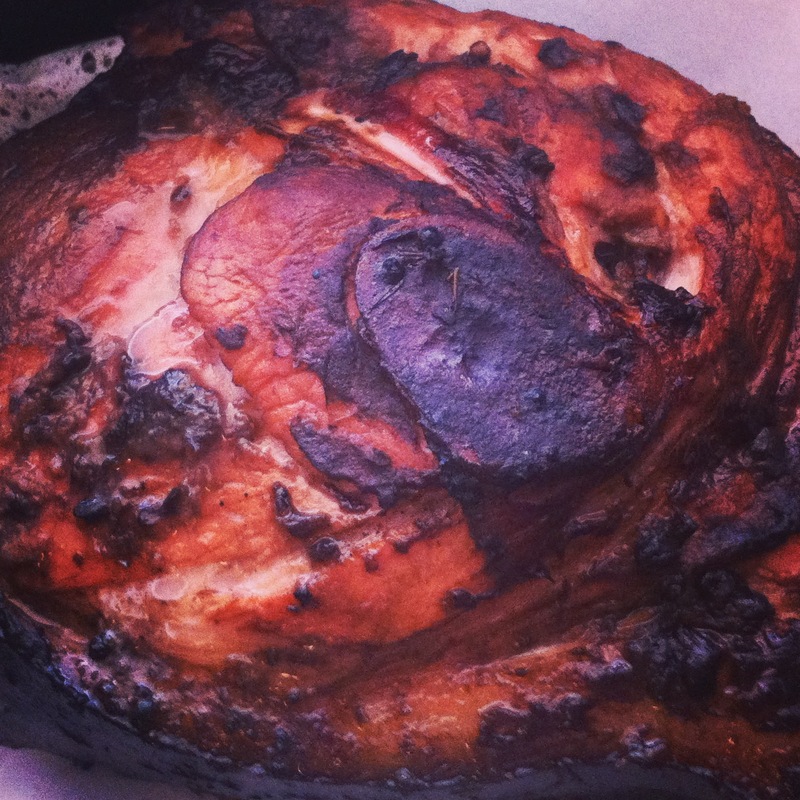 I also coated the sweeter ham (the one that sat in water overnight) with my homemade spiced apple butter. It added a perfectly spiced and apple-y flavor without too much sweetness. 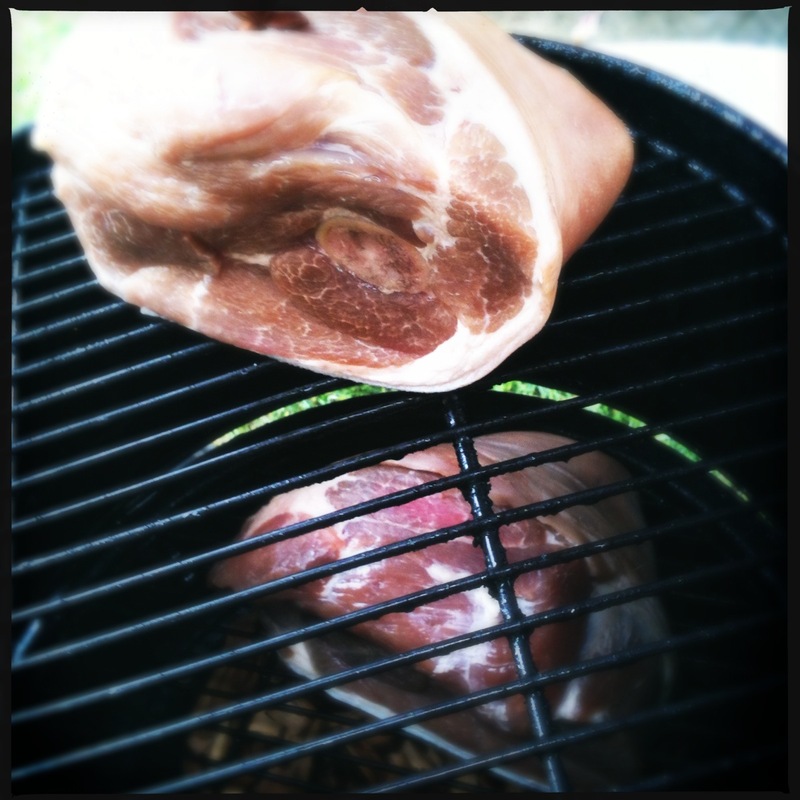 The hams need to smoke at about 300 degrees or less until they reach an internal temperature of 160 degrees. It should take about 6 hours. 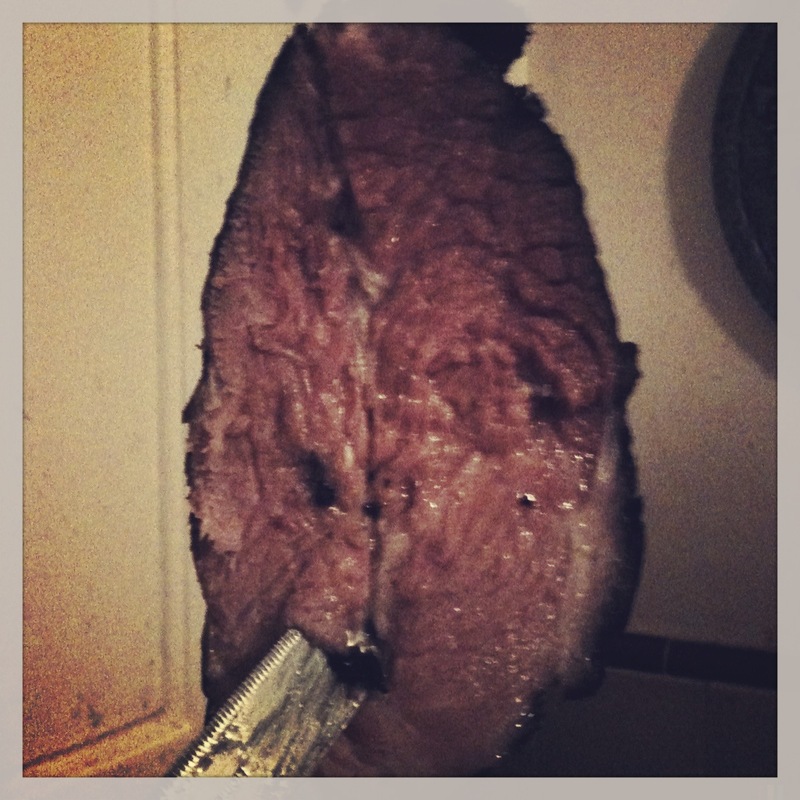 This year I threw a party on Christmas Eve; I planned out ahead of time how long the process would take so I could smoke the hams on Christmas Eve and we could all eat them for dinner. 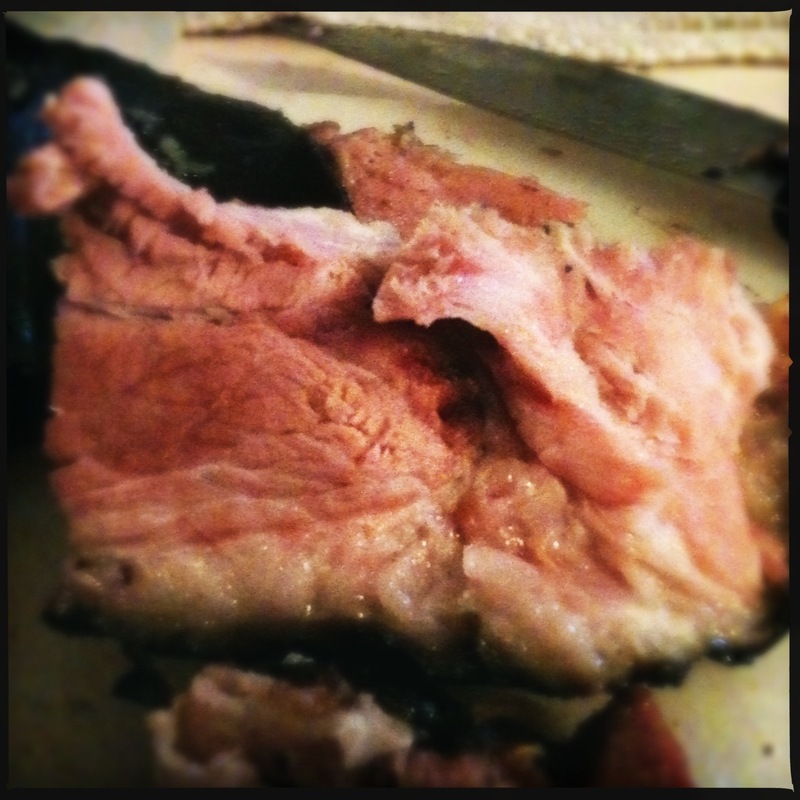 I have to say that despite the weather being unexpectedly cold and rainy (I live in San Diego so it really was a surprise to have weather in December), thus keeping my smoker’s temperature down and leading to a delayed dinner, the hams were a great success. Both of the hams were delicious for dinner, then the next few days’ breakfast (ham and eggs, a nice hammy omelette) and lunch (ham and cheese sandwiches), and a few days later, when little remained but the smoked ham bones, the bones were tossed in the crock pot with carrots, onions, peppers, spices and black-eyed peas that had been soaking overnight, and it made an insanely wonderful black-eyed peas dish for New Year’s Day. 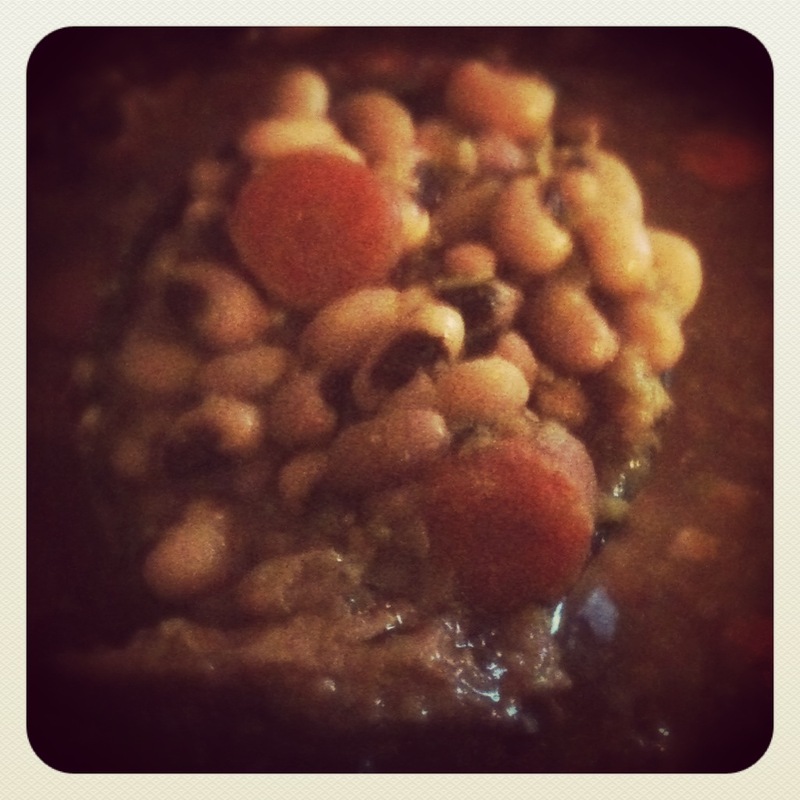 After soaking, draining and rinsing the black-eyed peas (soak them at least 12 hours), place them in the crock pot with all of the other ingredients except the spinach. Simmer on low heat for 16 hours or more. Check periodically and add more liquid if necessary. Serve with fresh spinach leaves (which will wilt when the hot beans are added). 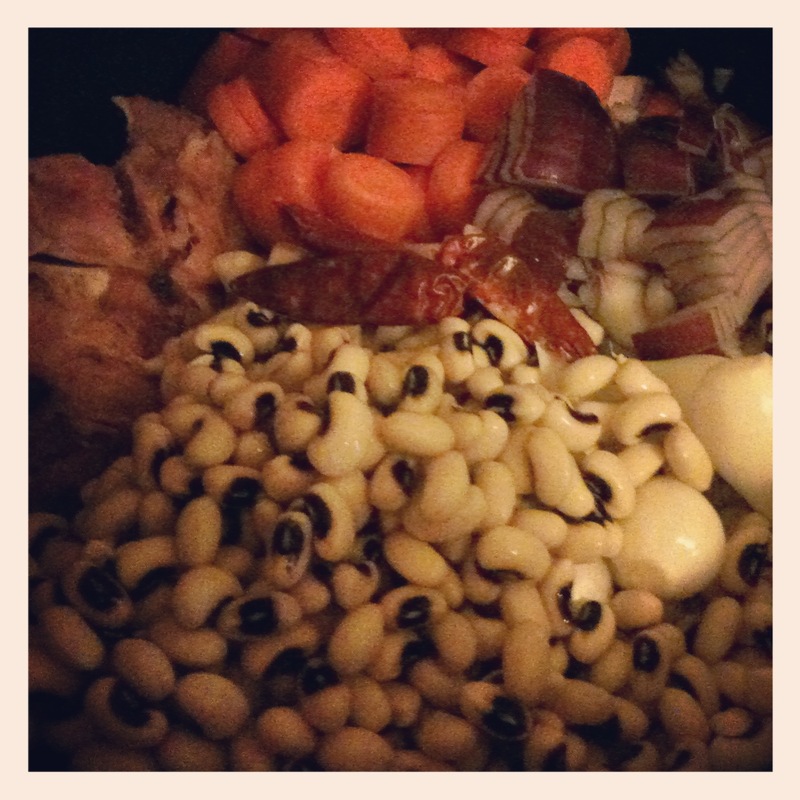 This entry was posted in cooking, food, holidays, leftovers, Uncategorized and tagged black-eyed peas, bonus recipe, brine your own ham, city ham, ham, home-cured ham, homemade ham. Bookmark the permalink. What kind of smoker do you use? I’d really like to try this! I have an M7P 7-in-1 smoker from the Masterbuilt company. I highly recommend it.